Sorry for the delay posting these! Well Done Fiona and Lyn, please grab your winners badges above and email me to claim your prizes! Winner of a £10 voucher for JOANNA SHEEN is..... #23 Clare - My Crafty Life Well Done Claire, please grab your winners badge above! Well Done all! Please grab your Top 5 badges above and winners please grab your badges and email me to claim your prize! Good Afternoon and I hope you're all enjoying the lovely sunny weather we're having lately! My kids are back in school today having had 2 weeks off, finding it totally weird that they're not off over easter except the bank holidays! They're in for 8 days the whole of April! Well my youngest is only in for 2 as she only goes weds and fridays so has lost 2 fridays! Thank You for your fab entries to our recipe challenge, we had a chuckle at some of them on the way - you know who you are lol! Don't worry we all have dippy moments! Speaking of Bank Holidays our new challenge for you is related to that - OK its a Royal Wedding but if you're not into royalty its an extra bank holiday for some yay! We're giving you some options this time, with the Royal Wedding less than 2 weeks away we'd like to see you use RED, WHITE & BLUE (These must be the most prominent colours) AND/OR A WEDDING CARD OR CREATION. We're sponsored again by the lovely Joanna Sheen who is offering a £10 voucher for her onlne shop which is crammed full of goddies with new stock arriving all the time! Thanks once again Joanna! Over to the team for their red, white & blue, and/or wedding cards! My Wedding Congratulations is a textured A5 card, a sheet of A4 folded in half. I stamped the image with a La Blanche Bride stamp, one of my most favourite stamps which I don't get to use as much as I would like. I have gently added colour to her skin with Ivory and Almond Promarkers and watercolour pencils for the remainder colours. Matted onto pink card and then layered onto textured silver card. I added a selection of flowers from my stash, and silver embossed Congratulations. I think she looks a Victorian bride so I added my grandmother's pearl necklace and my ear rings for a touch of realism. I choose to Celebrate the Royal Wedding by making a keepsake Concertina book. 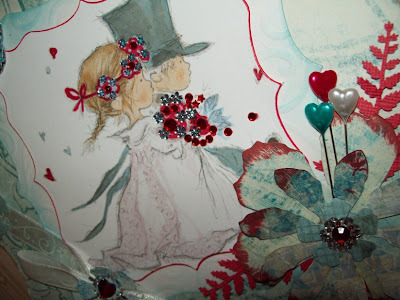 This was a Concertina Book Making Challenge over at Craftymess Forum - As the theme for here was Wedding or/and Red/White/Blue, I thought it would go together hand in hand. I used a lot of craft stash for this, but the basis is A5 Card stock with lots of old English London Maps, along with the colours Red, Blue and White only. A full description and further photos are available on my blog. image is large version of the ready printed images from LOTV. i have run round the edge of image with red pen then matted it up on white embossed (sizzix embossed folder) card tinged with blue distressed ink.decorated with flowers made with left over blue TH paper cut with TH tattered flowers tipped with red ink. and centered with prima jewel. added blue and white ribbon centered with red jewel in blue flower center. sentiment is LOTV stamped in red on blue disc. For this challenge I went with the colour scheme red, white & blue and coloured a Tilda with promarkers and derwent coloursoft pencil, added a couple of punched butterflies (which my teamies Sarah & Tracy will tell you one is hiding the mistake I made colouring the sleeve blue when I wanted it white lol!) Papers are digital by Bearly Mine Designs and the flowers are QVC and hobbycraft with a touch of stickles glitter. I knew for this Challenge only a Wedding Box would do!I stuck with the Royal Blue and White/Ivory colours, using a fab Glitter card for the main papers! Lots of gems, ribbon and flowers all over the box and my fab Wedding Couple form Woodware to add a Scottish touch to the box! For more details check out my blog. I went looking for inspiration among my unmounted stamps and got completely waylaid by some Craft Stamper freebies, and this was the result. 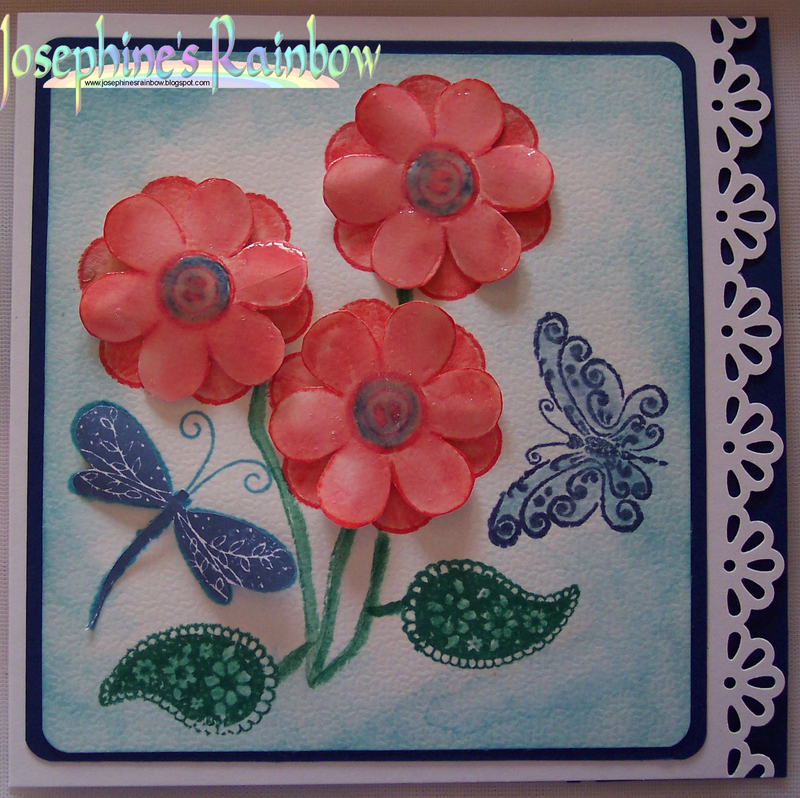 I stamped and coloured with Distress inks. The Paisley 'leaves' are from an Artemo set I bought in France last summer. I coloured a second set of the flowers and added glaze before layering them, and finished with a punched edge. 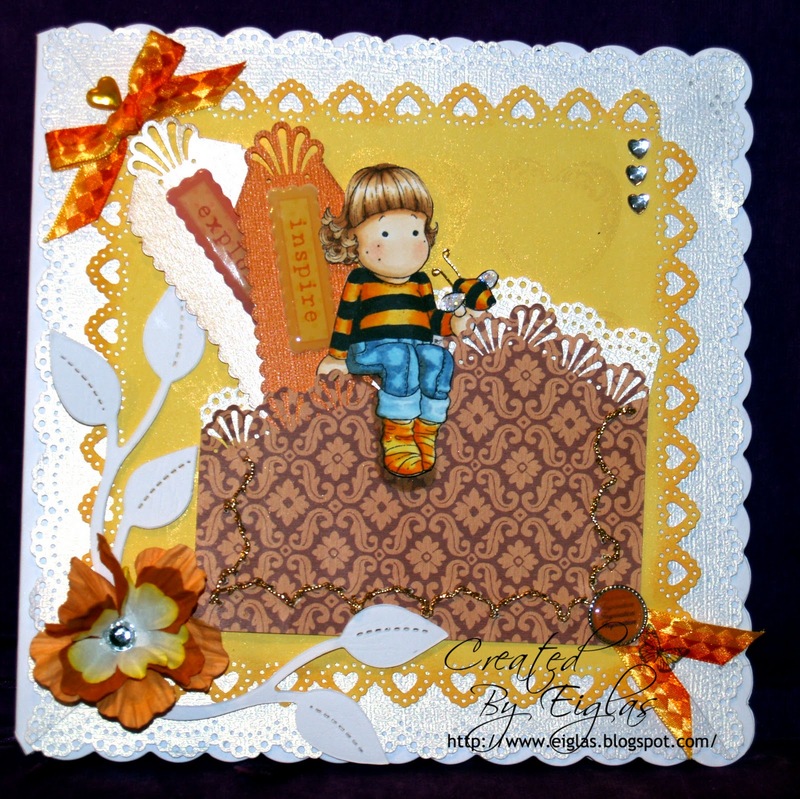 To create this card Ive used the Tim Holtz Sizzix 'Notebook' Embossing folder for the background.Next,I used the Tim Holtz bird and cage die then inked all the edges in brown chalk ink - Ive added a red punched heart, a Prima flower and finally the stamped sentiment. 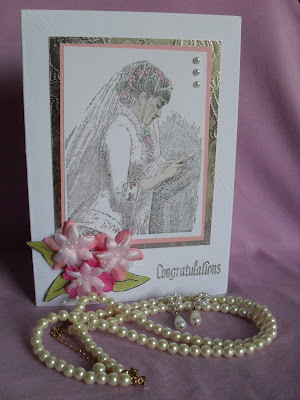 I used the fabulous bride stamp from Lilac Lemon Designs for my card and added lots of sparkle with a Sakura stardust pen. 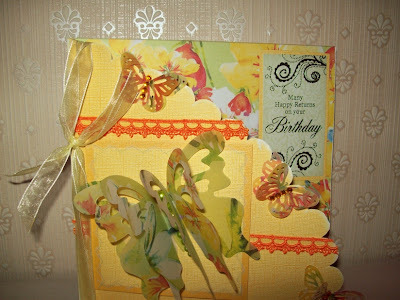 The fabulous swirly background paper is from a set called Rosehart designed by my very talented teamie Ei. ﻿I added the bride's bouquet to my card too. 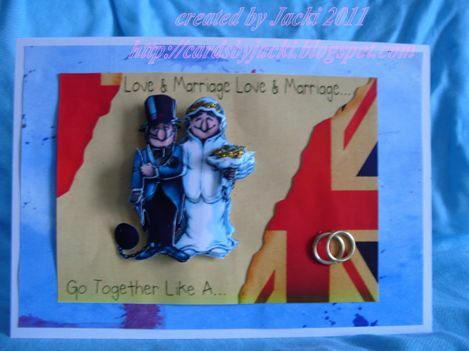 My card was a commission (non paid, lol) for a wedding of a steam engine enthusiast, not trains, but traction engines. 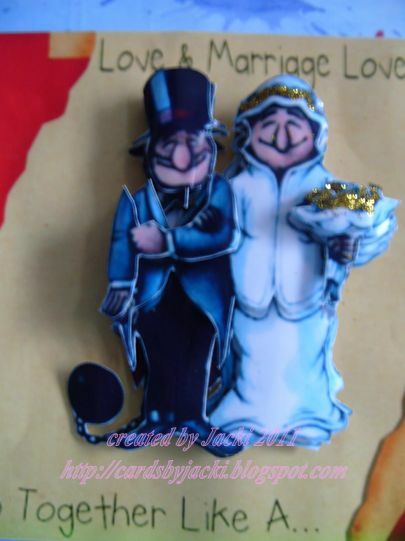 I was tearing my hair out trying to find something suitable when my lovely and talented teamie Ei came to my rescue with this personally designed couple sitting on a traction engine. Thank you Ei! The couple are coloured with promarkers and prismas pencils. Further details on my personal blog. I used some Whiff of Joy stamps to create this card. I stamped them and then cut them out, coloured them with Promarkers, used some Glamour Dust for the sparkle and then I added some Flower Soft to create some texture on the bench and to hide it a little as I felt it was very brown and needed something extra. 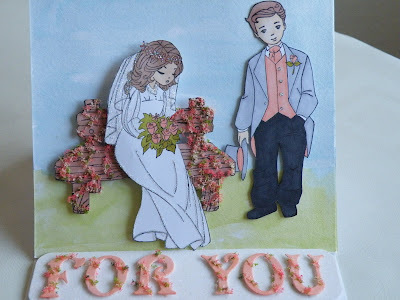 I used inks to watercolour my background on a pearlescent card and used the same card to create the letters, coloured with Promarkers and they also got the Flower Soft treatment. Anyone would think there was going to be a big wedding this year wouldn't they? I have coloured this lovely couple with promarkers and added a bit of sparkle with clear star gelly roll pens. The background papers are one I created myself in paint, and a freebie I found whilst having a mooch online. All papers backed onto red with the main image trimmed with a hearts corner punch to add to the love theme. A few red heart gems and a recoloured paper rose add the finishing touch. Hellooooooo! 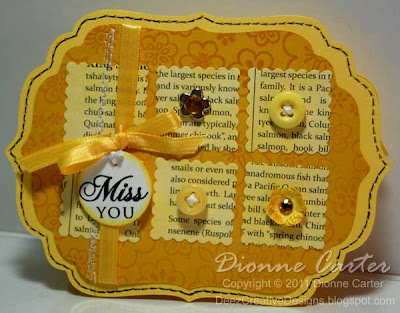 Welcome back for another challenge at Crafty Cardmakers! First we'd like to thank you for your fab entries to Melly's "Special Birthday" challenge, the winners will be announced in our round up post in a couple of weeks. Just a quick reminder that we now have a maximum of combining with 9 other challenges here although you can now enter as many times as you like so please take time to read the rules which are above! We are kindly sponsored for this challenge by The Stampman (and Lady of course!) who are ofering the winner a £10 voucher for their store, you can spend this online, in the shop or if you're lucky enough to see them at a show! They have a ton of items in store and one of their newest are their FRAMIE STAMPS which are designed to fit exactly into Nestabilites with many more coming in you need to check these out! Over to the team now, thanks for stopping by and I hope you enjoy the challenge! Dee Hello everyone, I'm hosting the challenge this week and it is a recipe. 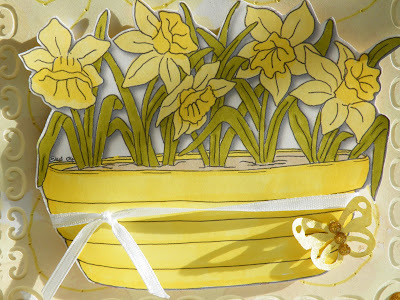 Use Yellow as the main color and these three embellishments, ribbon,stitching(real or faux) and rhinestones. I thought for this time of year yellow would be perfect. I love this card, it came together very nicely. 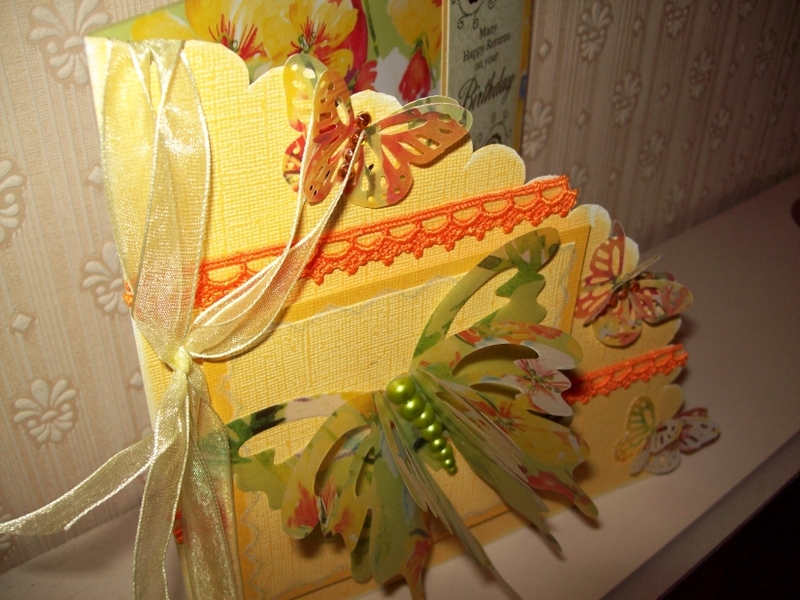 I started with 2 shape bases that I cut with my Cricut and then layered it in a darker shade of yellow. I pierced and faux stitched around the outside shape with black pen. I stamped and clear embossed the darker shape with a background stamp. I inked up some word paper with yellow and then die cut with a scallop square and attached to front of card and stitched up and down three times over the left two squares. 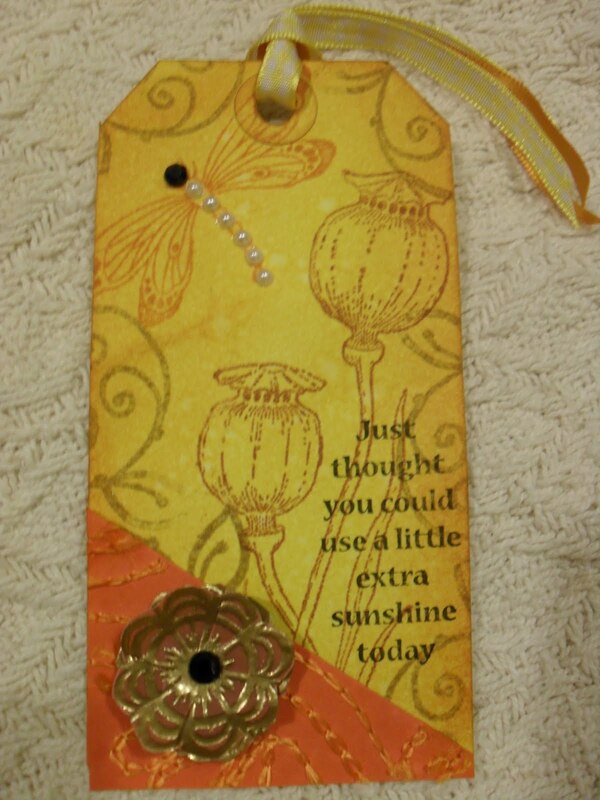 To finish off I added some ribbon, embellishments, and a sentiment. 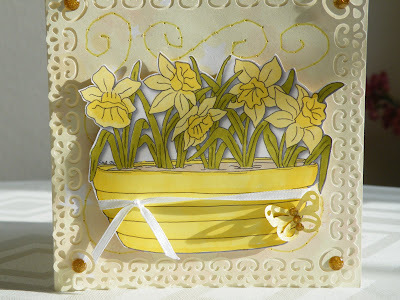 A lovely spring challenge from Dee, I made this tag, to send to a poorly friend. 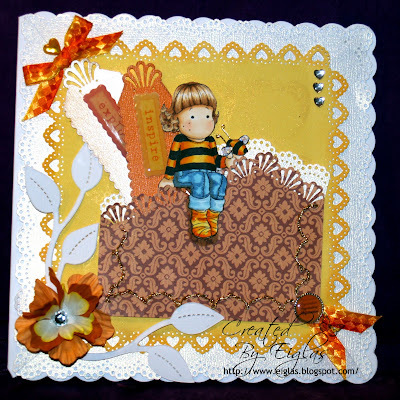 Poppy seed head stamp is from Elusive Images the ingredients in the recipe are Mainly yellow - Mustard Seed with a touch of wild Honey TH distress inks. Ribbons to tie the tag. Stitching, on a piece of Mulbery paper in the lower corner and finally rhinestones make the dragonfly's head, body and tail. The image in the corner hopefully represents the top of a poppy seed head, made by stamping a flower, gold EP applied, onto vellum. Mottos on bookmarks - K&Co. The image is, clearly, Magnolia Tilda holding a bee and I coloured her with my lovely Copics - the bee's wings are Stickled! 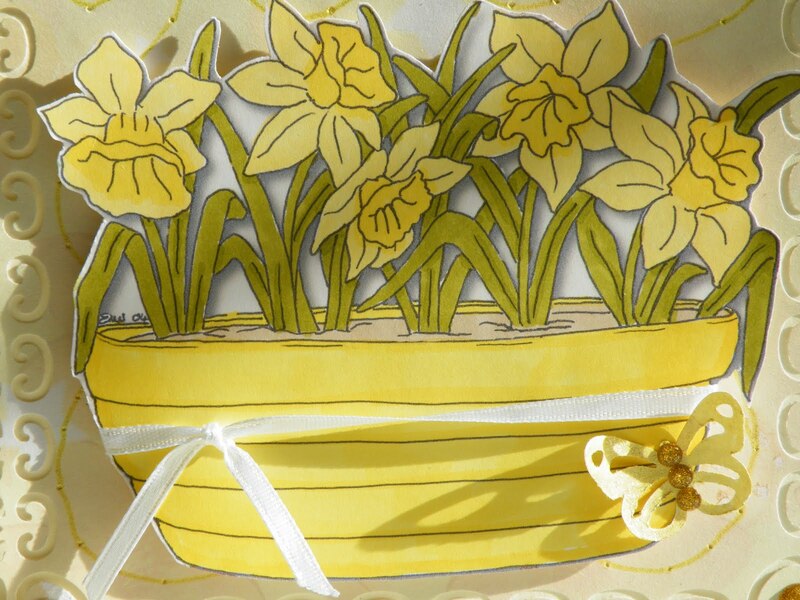 The lovely daffodils on this card were drawn by Eiglas I found them on her blog and for a mainly yellow card thought they were just the thing. I coloured them with my promarkers and cut them out. The paper is an old kit from Create and Craft but which one I don't remember. I punched the mat with a punch around the page set and created some faux stitching using a template I borrowed from a friend. I added some ribbon around the planter, a MS butterfly punch coloured with a metallic Sakura pen and some adhesive stones. I wasn't sure what I wanted to do for this one so I had a flick through my stash of digi stamps I've got printed out for rainy days and this one by Pink Cat Studio appealed as the challenge is to use yellow and she'd suit yellow. I've coloured with promarkers then used a brush to add some glue onto the flowers and sprinkled with glamour dust (aka ultra fine crystal glitter) I added faux stitching with an orange sakura souffle pen and airbrushed the centre of the flowers with yellow promarker which I think makes them look like fried eggs so I might alter that lol! I have decided to do a tag this time, using Sir T!m Holtz dies, I then dunked them in inkadinks and then a layer of distress inks on them. Added some yellow ribbon along the side, some Rinestones and the faux stitching around the edge ( I cant use a machine at all !!) The sentiments are Sir T!ms Vintage market letter dies. I really enjoyed this challenge, although i was a little dubious about the stitching part. I generally do faux stitching but from now on I will get the machine out. I used a Tilda stamp and coloured her with Promarkers & Derwent pencils. The papers are a real mish mash as I don't usually yellow so had to have a rummage for them. 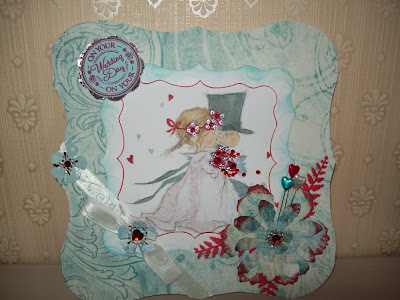 Added a Martha Steart punched border and some ribbon and then added some Nellie Snellen punched flowers, some large gems and a craftwork cards sentiment. this is wallet card really easy to do just uses 1 piece of card too. I used a LOTV stamp for main image cut it out with nesties the papers are from my own stash I have them a while so don't know who they're by sorry (**Vix also used the same papers and I believe they are papermania lol!) added some rhinestones to corners (pearly ones) and some yellow ribbon and a bit of faux stitching. For this wee challenge I inked up one of my new stamps that I got for my Birthday and coloured with promarkers! 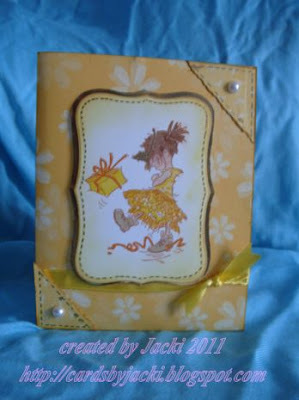 Following a wee sketch I used my yummy Basic Grey papers adding faux stitching round the edges of the layers. 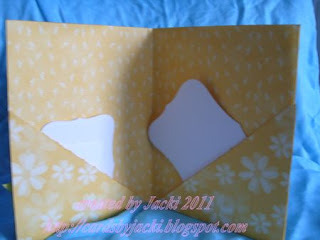 The ribbon is stitched through the middle to ruffle it using gold metallic thread. 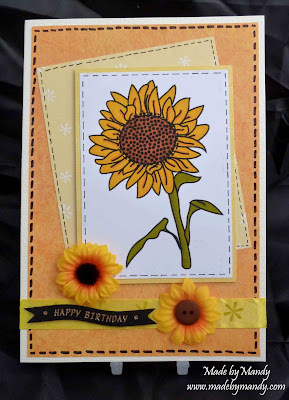 I added gems, flowers and stickles to finish the card. 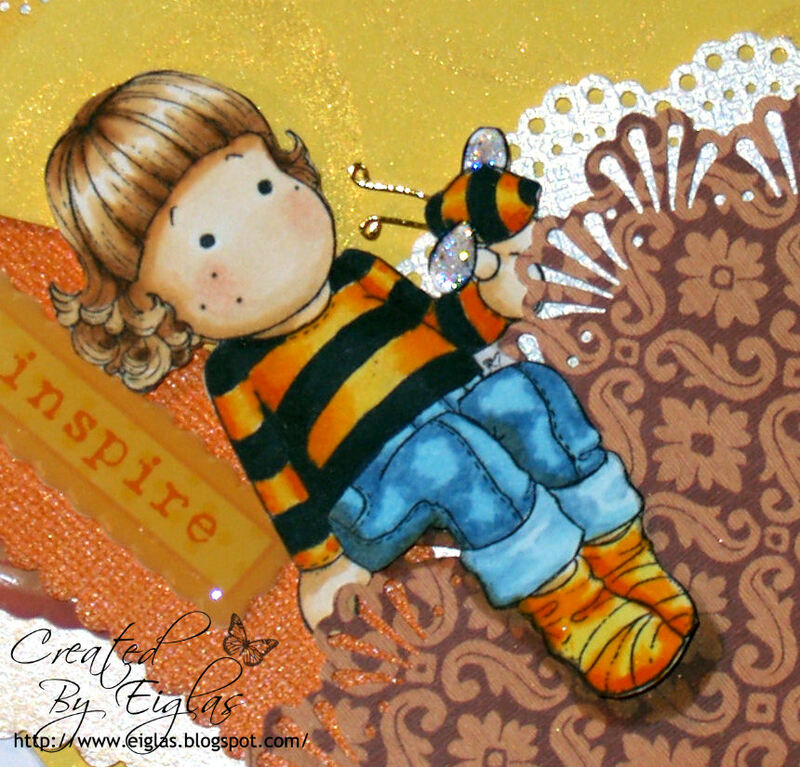 I made a background image using two digis from Make It Crafty and also printed separately a Mo Manning image called Lacie. I coloured each in with Inktense Watercolour Pencils and layered the finished image onto a piece of DCWV scalloped textured paper which I had first inked with Mustard Seed DI and edged with Dried Marigold DI. I Used the waste from a nestie punch out to form a frame which I placed over the image. I went around the edge of the frame with a lovely stitching stamp which I had forgotten I had (thanks for the reminder Vix!) in Wild Honey. 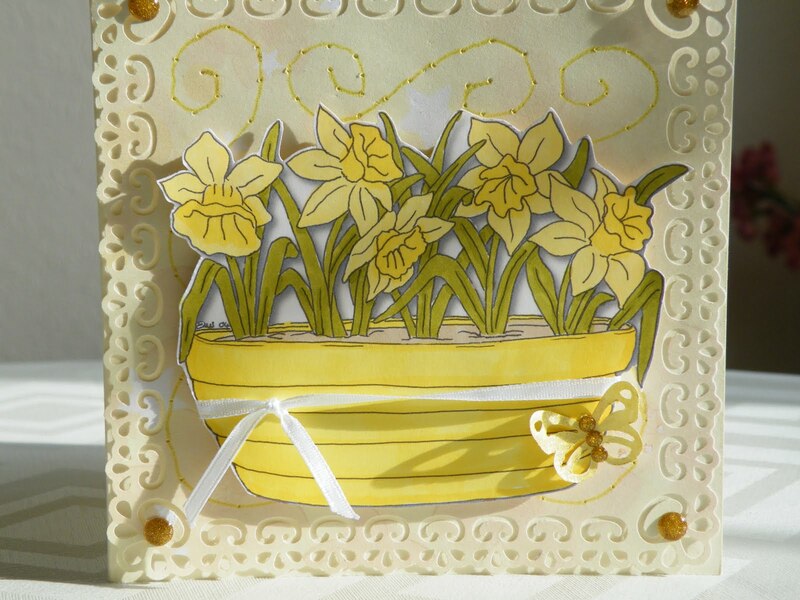 I made some flowers using primas, which I edged with Dried Marigold DT and some ribbon made into bows with a daffodil in the centre, again using Dried Marigold to bring out the centre of the daff. I stuck Lacie on the swing, and voila! I decided to try out something different for this card, and try my first triple twisted easel! It wasn't as difficult as I thought it would be, but is soooo effective don't you think? I used a Sweet Pea Stamp Jennifer Nilsson's Daisy Flower Fairy coloured with promarkers for the image and embellished with flowers coloured with promarkers to match. A few rhinestones and a ribbon and here it is. For the recipe challenge of Mainly yellow, stitching, rhinestones and ribbon I have chosen an image of a Sunflower as it is one of my favourite flowers, they make you so happy just to look at them and of course yellow is a happy colour too. I have coloured with Promarkers, added different shades of yellow paper and faux stitching on each layer. The fabric flowers are from a spray I bought at Poundland, ribbon, button and sentiment from stash. 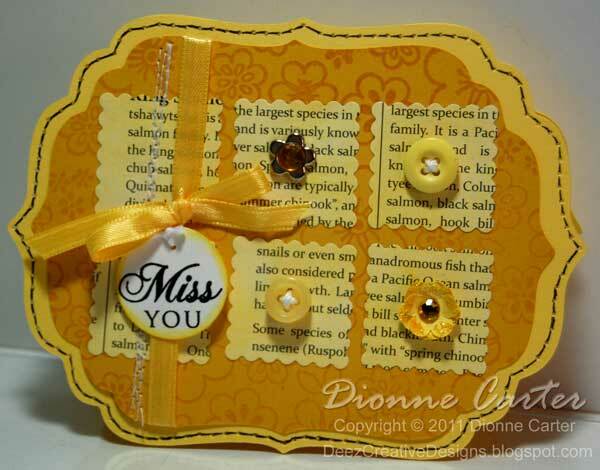 Added 2 small yellow gems to sentiment as a finishing touch.